New rental! This two bedroom/two bath fairway condo is on second level with lovely views overlooking The Sea Trail Maples Golf Course. The condo is pet-friendly (non-refundable pet fee will apply), non-smoking and has 1 King bed, 1 Queen bed and a queen sleeper sofa. The condo has 3 flat panel televisions, DVD player and high speed WIFI for all of your entertainment needs (No Phone). There is new carpet throughout the condo and each bedroom has a private bath. 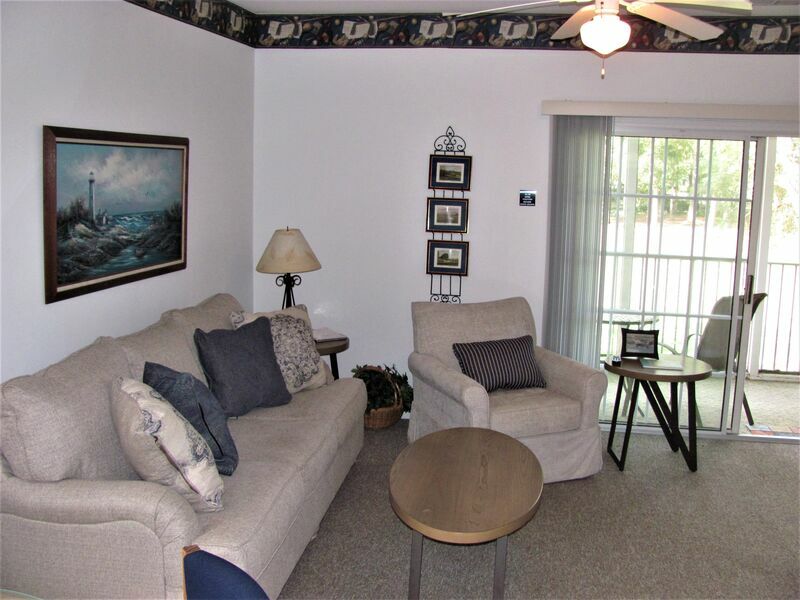 The condo has central heat & air and a laundry area with washer/dryer. The floor plan is open with adjoining kitchen, dining and living areas. The living area of the condo has glass patio doors that open to an outside screened porch area. This is a perfect retreat for relaxing and enjoying a cool beverage and fresh breeze after a day on the beach or golf game. The kitchen is fully-equipped with a bar area for additional seating. Kitchen appliances include dishwasher, microwave, coffee maker, blender, toaster, full-size refrigerator and range. Complimentary linens, towels and departure cleaning service are included for your convenience.